This month, Georgia will guide you through making these very cute placemats from the Kimberbell Cuties collection! If you have embroidery capabilities, you can get the companion CD and do the applique & quilting in your hoop. 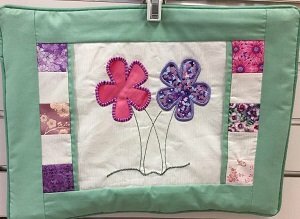 If not, you will do fusible applique and quilting with your favorite method. Click here for the Kimberbell Klub-Spring Flowers Placemats supply sheet.